Combine nice with useful: practical baby gifts are a good pick. Of course, something for the shelf is pretty - but if you give a useful present you can be sure that it is actually used. Often with thankfulness and good memories, too. diaper cake: nicely wrapped practical diapers! My recommendations include some special and unique practical baby gift ideas. And also some of which the new parents never knew they existed unless they hadn't gotten them as a present. At my baby shower I received some very cool stuff of which I did not know before and whenever I use these extremely beneficial items I am really grateful I have them. I hope you enjoy my best finds on practical baby gifts. There are lots and lots of 'common' useful baby gifts such as diapers, wipes, bibs, onesies, socks, bath time accessories, etc. And there is absolutely nothing wrong about giving something like this, especially if it is nicely presented such as in form of a gift basket, a baby sock bouquet, a diaper bouquet, a diaper animal or a diaper cake. Here are instructions for diaper gifts, such as the splendid diaper cake pictured above. Chances that the new parents have already got a highchair are high. But did they think of a portable high chair, too? If you know the couple likes to travel or go out for dinner a lot or even that mummy needs to take baby to work from time to time, a portable highchair surely is a great practical baby gift! Restaurant high chairs often are dirty and gooey and not very 'trustful'. If you bring your own you know for sure the chair is safe and clean. There are models that fold easily and are just clamped to the table. The Phil & Ted's Lobster high chair is lightweight and made of aluminum and nylon. It comes in red or black and is suitable for toddlers up to 37 pounds. Parents call this super practical travel chair 'a must for going out and travelling'. A carried baby is a happy baby! A baby carrier is not only a good thing when you are on the go. It also gives a mom or dad a little bit of freedom at home because baby is in a safe place and mom / dad has two hands free! Ergobaby is a leading baby consumer products company that creates innovative solutions to give both baby and parents the maximum comfort. Ergobaby carriers are the ultimate in ergonomics and comfort, allowing a parent to carry the baby from the early days to toddler (12-45 lbs.). Ergobaby have a vast range and you can choose from over 30 carriers in 4 categories. Check them out! It may sound strange to you to give baby clothes hangers as a gift but normally new families tend to have 'just' plastic hangers while you could give one-of-a-kind hand-painted wooden hangers such as the cute baby hangers from Kidorable. Also a great practical baby gift idea are baby closet dividers. They help to keep baby's closet well arranged and sorted by sizes. So mummy will find what she needs in a sec. The Nosefrida is a nasal aspirator helping baby to breathe better when its tiny nose is congested. It is recommended for ages 0-3. And even though this product sounds gross and nasty, it really helps and most users claim this nasal aspirator to be the best product on the market. Babies and toddlers can not independently blow their nose, this has negative effects on their sleep and food intake. And often the entire family is 'suffering' with baby and has sleepless nights, too. The Nose Frida snotsucker effectively helps when baby's or toddler's nose is congested and makes breathing easy again. See gift ideas helping babies and toddlers to fall asleep more easily. Let baby, and consequently the new parents, slowly drift away into a peaceful slumber with these practical sleep aids for babies. convenient in cold weather, too! A kids wagon always comes in handy whether for a trip to the zoo, the park or any other outdoor activity. It sure makes a practical gift and at the same time it brings fun and entertainment. 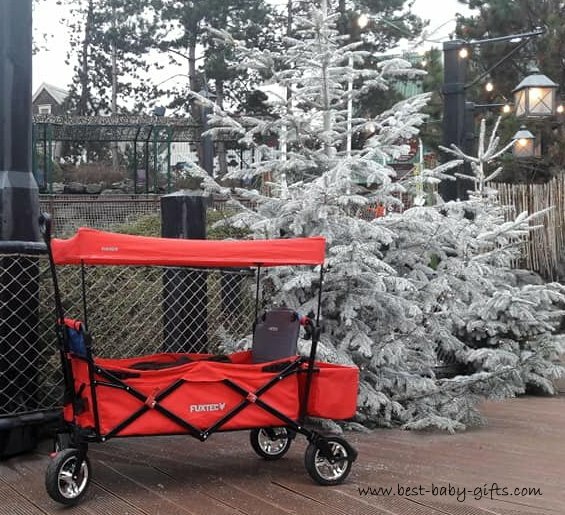 You should think a wagon can only be helpful in summer and warm weather but it can turn out quite handy in winter time as well! See various models of kids pull along wagons. This baby nightlight is just awesome and so cute at the same time! It's hard to decide which nightlight to choose as a gift as they are all so adorable. The Cloud b Twilight constellation nightlight comes as a turtle, a sea turtle or a ladybug. And absolutely everybody loves it - mum, dad, baby, toddler and kids are equally thrilled. The Cloud b animal nightlights project star constellations onto the ceiling at night and soothe babies and kids who are afraid of the dark. It uses batteries but will turn off after 45 minutes to preserve battery life. The nightlight comes with an adoption certificate and a constellation guide. The bubbly Octopus To Go nightlight is equally as cute and projects stars or images no matter whether you are on the go or at home. Click on the photos below to find out more about this absolutely beautiful practical baby gift! How about a colorful baby bouncer, baby swing or baby playmat? These keep baby entertained and safe for a few minutes so mummy can quickly have a phone call or do some cooking while having at least her hands free. Some of these bouncers and swings even come with a built-in entertainment center or a musical toy. 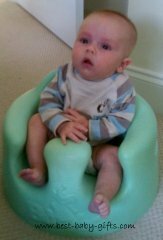 The Bumbo Seat is a floor seat where a baby of approx. 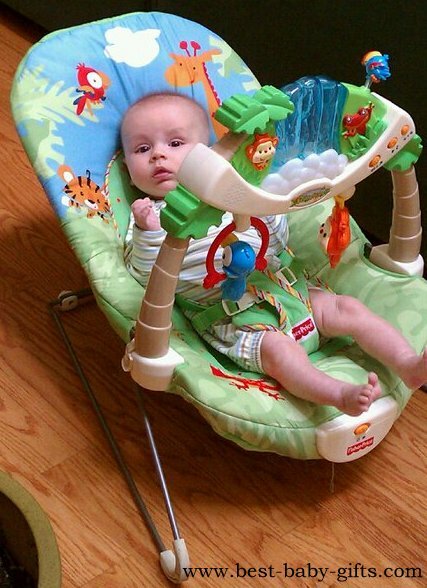 3 months and older can sit up on its own - this makes mommy's (and daddy's) life just a little bit easier! 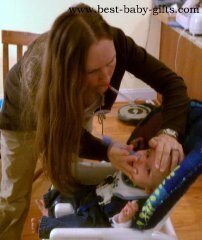 Now it is possible to involve baby into family life and have him or her see what goes on, keeping baby busy. Check it out! This organizer will help the new family to keep all their baby essentials tidy and organized as well as within reach whenever needed. This caddy is very spacious so it will be a breeze to store everything from baby's bottles to diapers and wipes. This set even comes as a gift package that includes some extra gift goodies such as 2 pacifier clips and 2 organic drool bibs for baby. Give it as it is or stock it up with some more baby items such as a onesie, baby bottles, baby toys, a grooming set, etc. A nursing pillow is not only great for nursing but also for letting baby rest comfortably and fully supported. The versatile Boppy Pillow lifts the baby to an ergonomic position for comfortable feedings, then transitions to the perfect spot for propping, tummy time and learning to sit. Most Boppy Pillows have a removable slipcover which zips on and off for machine washing. The Boppy Nursing Pillow is also available with a 100% organic slipcover. Lots of positive reviews on amazon confirm that the Boppy Pillow is one of the best nursing pillows around, and it makes a practical baby gift for sure. A teething necklace for mom to wear and baby to chew on or an amber teething necklace for baby can help when the little one starts to teeth and is in pain. A happy baby means happy parents, so this for sure is a very practical gift, too. In my twins baby gifts section I have listed some more practical baby gifts which are not only helpful for twin parents but also for singleton parents! View more practical baby gifts here!